Most of us have been taught to take the blame for things that we didn’t cause when we were stuck in feminine roles. We’ve been guilted or shamed; and we’ve been taught to please others, especially authority, even if their demands are ridiculous. Blame, shame, and guilt are the Superglue of the illusion. They don’t exist in the true world. Therefore, with some discrimination and wisdom, we can free ourselves from them. In the true world, there are no roles. But roles dominate our social structure (the illusion), and that isn’t a problem as long as we honor the natural flow of the energy in the illusory roles we play. Blame involves a reversal of the natural flow of masculine and feminine roles. Normally, the masculine energy (intellect) holds the beliefs, and the feminine energy reflects those beliefs. In blame, the masculine energy says that the cause of the problem lies with the person or people playing the feminine role. Or sometimes, the person in the masculine role blames another masculine role (like Obama and Bush/Romney). If we are in a feminine role in the illusion, we cannot be blamed unless the leader wasn’t really leading. If the masculine role is leading from truth as it should, nothing bad can go wrong. When things go wrong, it’s the leader’s belief that’s the cause, not the follower’s reflection of the belief. Only the person in the masculine role can drop the causal belief. The emotions and wild behavior, that often occurs in the people in the feminine role, are the effect of the false beliefs of the masculine. When the mind of the authority changes, their feminine reflection changes. To fix the feminine is to fix the effect. To blame the feminine is to blame the effect. It doesn’t make any sense. But we accept this reversed way of thinking because we’ve been trained to. Everyone in the illusion is breaking their own mirror. If you blame the feminine, you can’t solve the problem. The feminine doesn’t have the responsibility; it’s not the cause. The child can’t fix their parent’s belief. The employee can’t fix their CEO’s vision. Church members can’t fix their preacher’s mind. Citizens can’t fix their leader’s flawed perspective. The feminine can leave when they’ve had enough, or they can let go and become the masculine. Fighting (or war) happens when the feminine has had enough and tries to take the power back from the masculine. Crimes are often committed against someone who reminds the criminal of their hated masculine authority. To fix problems, the authority, masculine role, must take responsibility, fix their own mental cause, and everything will go back to perfection. But that almost never happens in the illusion. Early Bible stories trained our western mind to reverse our natural cause and effect thinking. Eve (feminine) got blamed for the fall. Moses (masculine) blames his people (feminine). When you understand the masculine-feminine relationship in the illusion, you can’t be fooled into taking the blame any longer. 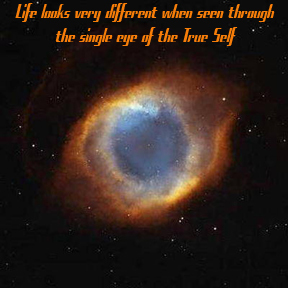 This is also true within ourselves. When something goes wrong in our life, the cause is in our intellectual masculine mind. Our emotions are only the messenger — we should never shoot the messenger. If we let go of our own causal beliefs, our emotions will calm down immediately. But often our own inner mental masculine, just like outer physical masculine authorities, wants to be right at all cost. Guilt and shame are given to us by authority figures (masculine roles). No one is born with guilt or shame. These two emotional states can be difficult to let go because someone else imposed them on us. Our mind says that we can’t let guilt or shame go; the authority must free us. Since we’re lower in power (feminine) than the authority (masculine), we think that we don’t have the right or ability to remove the causal belief. This is a disgusting trick of the false mind. It can keep us stuck for a whole lifetime. The True Self is not capable of doing anything wrong because right and wrong comes from the false self. If we did make mistakes (sins), we did so because we were caught in the illusion, a false self. We didn’t want a false self; our authorities gave it to us when they taught us their beliefs and said they were true. Our false self was created in the image and likeness of our false authority figures. I’ve followed many people’s guilt and shame back to the source; they all lead to a really powerful, but rigid, authority figure (usually religious). Crime is not caused by evil people. Crime is caused by the religious-perpetuation of the belief in good and evil and right and wrong. We see it because we believe in it. In my experience, and I’ve done this hundreds of times, the person who is blaming, shaming, or guilting was projecting their responsibility, negative character trait, or belief on to the person in the feminine role. 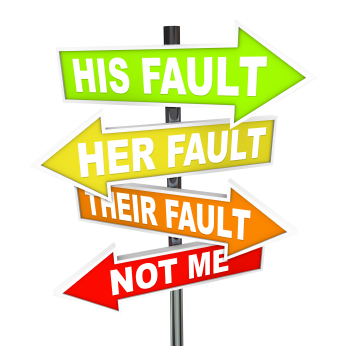 Once we take the blame, shame, or guilt, they have no reason to ever fix their problem. Their mind feels a sort of fake freedom. That’s why when we let their projection go, they often react with lots of emotion. That’s their problem. When you drop blame, shame, or guilt from your mind, your True Self can breath again. If you are someone who thinks others should be blamed or shamed or guilted, you probably aren’t reading this blog. 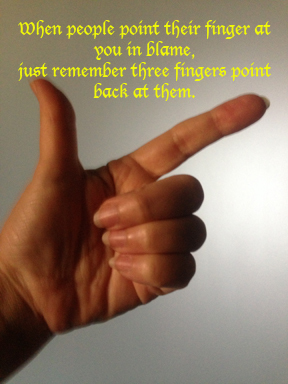 But just in case you are, remember that when you point the finger at another, three fingers are pointing back at you. The cause is within your mind; and if you let go, they won’t reflect you anymore. Letting go is always win-win for everyone. When I was little, I’d often find myself caught in some stupid habit or pattern of thought. My mother would say, “Ah, don’t worry about it. It’s just an awkward phase.” What might have become an obstruction to my freedom, like OCD or a serious addiction, left about as easily as it came. Those are great words to remember on the quest for freedom because it often seems like one big awkward phase. The reason for this is that when you start to choose freedom (the True Self), the remnants of your false self show up so that you can let them go. But often they look very real, important, and true. Usually they involve others. Let’s look at some areas where awkwardness shows up on freedom road. Let’s pretend that your family had a tradition of Uncle Joe dressing up like Santa and bringing gifts to the children every year. Now you’re an adult; you’ve not believed in Santa for a long time. All the kids are gone, but Uncle Joe still dresses up. It no longer makes sense. It’s awkward. But even worse, now that you’ve decided to live from your True Self, you find that you can’t lie anymore. Lying obstructs our freedom; it feels bad — yes, even so-called white lies. Uncle Joe isn’t Santa. The tradition that once looked fun now looks abominable. In time, every tradition looks wrong from the eyes of the True Self. Traditions are just beliefs on a schedule. Traditions serve the false self. So you’re in a quandary. You don’t want to ruin what others think is fun; but to pretend Uncle Joe is Santa, you have to honor beliefs that now look ridiculous. Awkward! People who live with both feet planted in the illusion love heroes and often shine way too brightly in a crisis. For twelve years, I lived in a rural Virginia town and never saw an auto accident; my friend saw them all the time. She loved getting in there to help. I started to wonder if she was helping or causing the accidents. Love is defined in the illusion as rescuing people from their problems, honoring that they’re victims with no responsibility, and care taking or serving without whining. Now do a 180 and head for freedom, and you realize that all suffering is the product of the beliefs we’ve borrowed. You can’t bear to watch someone suffer, victimhood looks like a jail cell, and you abhor problems. But what do you do with the problem lovers and victims in your life? Awkward! Then there is the flip side where you mess up and create some crap in your life. You know you’re responsible, and you just want time alone to work it out and clear your mind. But friends and family all want to help you. They start to feel sorry for you, and you want to kill them. Very awkward! The illusion is all about what you do and what is right and wrong according to the illusory rulebook you’ve chosen to follow. Now you board the freedom train, and you recognize that intention is what really matters. Your friend is whining about her bad child for the tenth time this week. But you can see the truth. Her story is contributing to her child’s behavior. Social conventions say a friend is a good listener. But you want your friend to have a great relationship with her child so you suggest that she drop her story. Your friend gets very mad and says you’re rude. Now who is really the rude one? Is it more rude to bombard your friends with all your problems and victim stories; or is it more rude to say, “I think you’d be better off if you dropped that story?” Awkward! Then there is the flip side where your friends are all talking about American heroes, war, their beloved political party, and pride in America. They’re funneling tons of fuel into the illusion, and you say nothing. They call you unpatriotic and say you don’t care about your country. But you understand that they’re contributing to more war and problems for the country. You don’t want to contribute to that. So you look bad again. Awkward! You work very hard on your mind and more and more you realize that if you are thinking something that generates emotion, it isn’t true. So when your family or friends piss you off, you go to work on yourself. They start to think they’re perfect. They never cause a problem anymore. But then you do something that causes them emotion, and they blame it on you. They still think that others cause their emotions, and they have no intention of letting what they see in you go. Even worse, most of the time you didn’t do what they thought you did. They just caught a glimpse of their own reflection. Now just try to explain that you didn’t do what they’re sure you did. Super awkward! None of these situations are fun. In fact, they often make you feel like moving to a remote deserted island. You feel like the world is just too crazy to live in. What causes these awkward moments is that in the illusion, we’re trained to see though the eyes of other people or other beings like the old-man-in-the-sky God. When we move toward freedom, we start to see the world through clear eyes. However, we still remember how others saw us before. We’re meeting the past moments that caused us to adopt someone else’s rulebook and abandon our True Self. Old fear arises that we’ll be judged, humiliated, or punished. But that can’t happen if we just remember to let go. What looks like an awkward moment really is one more opportunity to gain freedom. As long as we remember to let go, it really is just a phase. In the mid-1990’s, Chris Kattan played the flamboyant Mango on Saturday Night Live. As you can see, Mango verbally tells Garth Brooks to get away; but when Garth Brooks does as requested, he pulls him back with his animal magnetism. Garth Brooks is clearly confused; he wants to get away from Mango, but can’t. He obviously can’t come toward him and leave him at the same time. When I first saw this skit, I thought it was hysterical. Like most great comedy, it exposes the shadow reality that people usually deny. Mango demonstrates the double bind, which is a highly emotional and challenging dilemma. A person (Garth) receives two conflicting messages, and one message negates the other. A successful response to one message results in a failed response to the other. The receiver is stuck in lose-lose. You might know this experience by another name, the Catch 22. It is the situation that you just can’t win. Usually, one message is external and the other is internal or unspoken. We don’t see the conflict, but we feel it. In order to cope with double bind messages received from others, most people learn to ignore their feelings. They train their minds to listen to people’s words and blindly obey. Others, especially children, find themselves in unexpected trouble because the emotional pull of the unspoken message is stronger than the verbal request. A symptom that we’ve been caught in the web of another’s double bind message is that we wonder why we behaved or reacted as we did. We might say something like, “I just wasn’t being myself.” Sometimes the other blames us for the conflict; and yet, we can’t see how or why we were the cause. Most of us have our first double bind experience in early childhood. That sets the stage for many more such experiences throughout life. These memories feel unresolvable because we just can’t find the cause. Understanding the cause of the double bind is key. This can be tricky. Mango clearly knew what he was doing, and he was the cause. But he hides his wacky hand motions when Garth turns around; he doesn’t want to be exposed. It is unlikely that Mango would be willing to admit to his purposeful manipulation; Garth Brooks was right to walk away. Politicians and slick sales people send out multiple double bind messages in their conversations; they purposefully confuse you so that you will ignore their conflicting data and do what they want. They have no intention of admitting that they are the cause. Most of us send innocent double bind messages. In the cartoon above, the character probably doesn’t realize that he’s sending out a double bind message of “I get no respect.” He probably blames the people who don’t respect him for being ignorant, rude, or not honoring his authority. This double bind can be fixed if the sender takes responsibility for their confusing message. They have to recognize that they are seeing the mirror image of their message in the other; then they can let go of the causal belief in their own mind. If we are blaming another for our unhappiness or our lack of fulfillment, we are sending a double bind message. We want the person to love us, but we don’t believe we are worthy of their love. We want the job, but we don’t really want to work. We want our children to get along, but we believe that all children fight. Our minds are full of internal double binds. We waste our life trying to manage them, hide them, and leap over them. What if we are on the receiving end of the innocent double bind message? The sender believes they are being crystal clear when their message is actually double bind. This is very common. First, we have to get our own mind clear because the double bind message has probably confused us. There is a causal belief within us that got us into this situation; letting that belief go is our work. We find our own causal belief by looking at why we are in the situation, and more important, why do we believe the sender? Often, they play the role of authority figure in our life. We might be married to the sender; or we could be their child or their employee. We have a belief in our mind that we must believe them, please them, or make them happy. And we can’t succeed. For the receiver, the cause is rarely about the message; it is nearly always about a win-lose or dominance-submission relationship. When we are clear, we can sometimes help the other to see their double message. If they are willing to let go of their beliefs, then a positive outcome can be achieved. The sender gets rid of their conflicting belief and the receiver can decide to give them what they want (or say no) with clarity. But if the sender won’t change, it is time to leave our Mango behind. Most of us have loads of memories of double bind situations. They often sit in our mind wrapped in guilt or shame. We can resolve the double bind memory by re-experiencing it in our mind. It isn’t easy; and if you are not experienced with this, I recommend you do it with the support of a friend or mentor. Clarity comes when we can see the message that was sent and the message that was received. Even if the other person is long gone from our life, we can free our own mind by letting go of our part of the double bind experience. PS: I had a best friend years ago that was just like Mango; and I adored her because when I said to her, “Stop being like Mango,” she laughed. You see, Mango isn’t bad or even a problem when exposed. Mango is only a problem when he’s hidden. Click here for another article that offers some advice for getting beyond painful memories.